The people over at sf911truth.org have setup an art contest which ends on June 1st, head on over that way if you've got some mad art skillz. 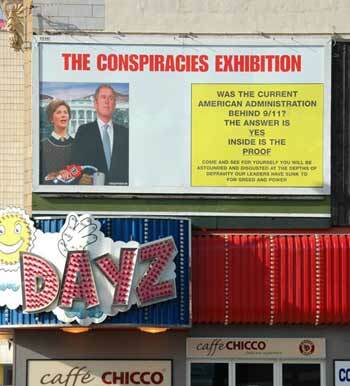 The World's first Conspiracies Exhibition has opened on sea front in Blackpool, UK and features an extensive section covering September 11th. The exhibtion is showing the documentary In Plane Site continuously. I would suggest they switch their DVD players to carry The Great Conspiracy and the recently released Confronting the Evidence: A Call To Reopen the 9/11 Investigation. (FREE DVD).. these 2 make up the most solid footage to show to anyone interested on the subject.. in my opinion of course. On the afternoon of 11 September, Donald Rumsfeld, having failed to act against those who had just attacked the United States, told his aides to set in motion an attack on Iraq Â­ when the evidence was non-existent. Eighteen months later, the invasion of Iraq, unprovoked and based on lies now documented, took place. This epic crime is the greatest political scandal of our time, the latest chapter in the long 20th-century history of the westâ€™s conquests of other lands and their resources. Thanks for linking to flamesong.com and for the suggestion to show alternative documentaries. Unfortunately, I haven't been able to get hold of a copy of 'The Great Conspiracy' and as yet the free DVD from Jimmy Walter which you also mentioned has not arrived. In Plane Site is not my first choice of documentary - if there was a DVD version of David Ray Griffin's The New Pearl Harbor I would show that. flamesong (not verified) on Tue, 05/24/2005 - 3:09pm. dz (not verified) on Tue, 05/24/2005 - 3:10pm. On a slightly different matter, please see http://www.flamesong.com/imuk/action01.html for details of an action which was carried out against Indymedia UK to protest against their persistent censoring of items regarding September 11th. flamesong (not verified) on Tue, 05/24/2005 - 3:11pm.